Mystery Room takes place in London and introduces two new main characters: First is the somewhat-bumbling but good-hearted Detective Constable Lucy Baker, a cap-wearing, enthusiastic young woman with such a slang-filled way of speaking British English that I sometimes got lost with her dialogue. She’s just been assigned to work with the second new main character, the gentle-spoken and patiently thorough Inspector Alfendi Layton, in the department of Scotland Yard that takes care of the toughest cases. Yes indeed, it is the son of the famed Professor Hershel Layton — one of his sons, at least. The first thing to do is rid yourself of the expectation that you will be playing a game along the lines of the rest of the “Layton” series. You’re not. You’ll be playing a game that’s more like the Ace Attorney games, so MUCH more that you’ll probably wonder (as I did) why the name “Layton” is in the title at all. In fact, I ended up constantly comparing this game’s experience to Ace Attorney. 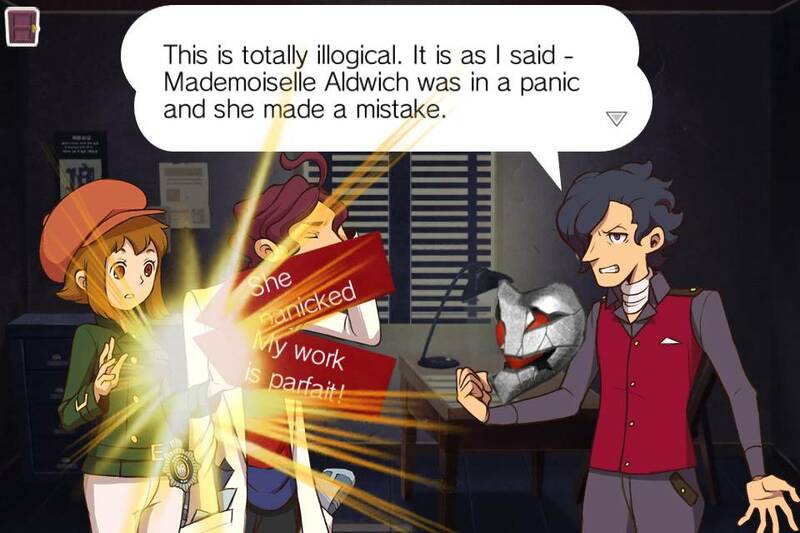 The investigation of the crime scenes, the silliness of the interrogation of suspects, Alfendi’s abashed expressions, and the flash of characters cutting across the screen as the investigation nears its climax — these scream “Ace Attorney” so loudly that it practically drowns out any presence of Layton. Mystery Room comprises a series of murders that you must solve in good ol’ police detective fashion: by examining the crime scene, reading witness statements, and occasionally getting a hint. The cases generally get more difficult as you progress through the game, and of course there is an overarching storyline that culminates in the final mystery. At the beginning, no sooner does Lucy introduce herself to Alfendi — affectionately called “Prof” by Lucy and “Al” by other colleagues — than the inspector tosses her immediately into a case that has just come in, saying it will be the perfect way to test her suitability for the department. He goes over the facts and asks Lucy for her gut instinct as to who the criminal is. In response to her surprise at having to deduce the perpetrator without doing any investigating, Layton shows Lucy his one-of-a-kind crime scene reconstruction device. Using the reports and descriptions from the field officers, Layton recreates the location, down to the smallest detail, right inside the confines of Scotland Yard. It’s great for the brilliant “Prof,” who almost never leaves the office except to go home. And so the game is afoot. At this point you’ll have a few options: examine the crime scene, check the case files and case summary, or name the culprit. That first option is, of course, is where the most fun comes in. Sort of. When you start inspecting the scene, you’ll get a brief tutorial to moving around the area. In most of the cases, Layton gives you a mere five minutes to look over things. Usually, though, that will be enough time — you can check only certain parts of the scene that are marked clearly with white circles, and you can examine only certain items within those circles, all of which are marked with white dots that turn yellow once you’ve looked at it. You can also zoom in to find more items. Tap on everything that’s marked to enter them into the evidence files while a text box pops up describing whatever you’re looking at. When you return to the overall view of the crime scene, a check mark (or a “tick” in Brit-speak) will appear if you’ve examined everything possible within that particular circle. At any time, you can go into the files by tapping the icon in the upper left, which stops the countdown so you can take all the time you want reading item descriptions and suspects’ statements. Each item also has a “Hint” icon in the lower right corner, which leads to Lucy and Layton having a brief conversation that sometimes gives additional information about that piece of evidence. When you think you’re ready, tap on the “Name the Culprit!” button in the upper right corner to give your judgment. In the first three cases, my guesses after just the initial perusal turned out to be correct. Still, I dislike that five-minute restriction. Before I knew what the mechanics of the game would entail, I rushed through the crime scene to cram everything within the time limit. And even though you can explore things more slowly after that, you feel like you still need to hurry as you’re acutely aware of the fact that Layton and/or the suspect are standing there, waiting for you to come up with the right answer. All that will have a familiar feel for those who’ve played Ace Attorney games before. The main annoyances are the seeming lack of touch sensitivity (which I’ve complained about since touch-screen games were first created), and the words “Entered Into Evidence” that briefly block your view of the text box when you examine something for the first time. Also, when statements or descriptions get updated, that process can sometimes take a long time — a fact that Lucy makes note of, which elicited a laugh from me, because it certainly is the truth. 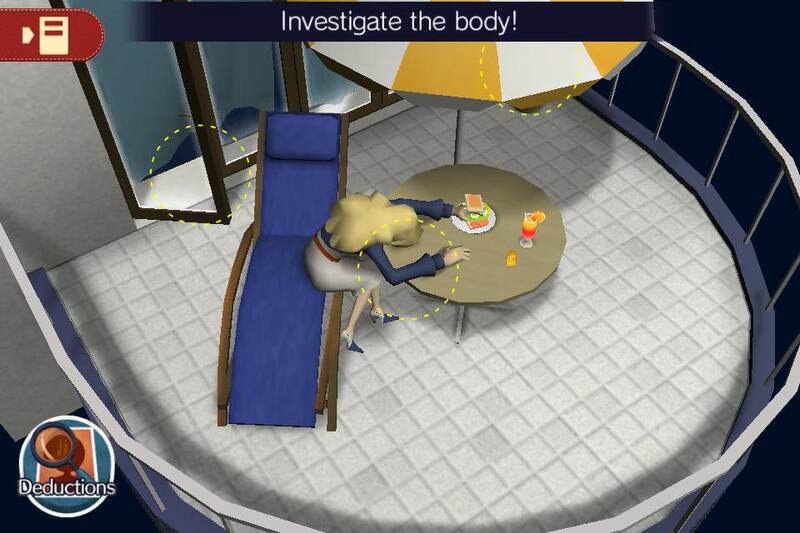 In later cases, you will have four options after Layton asks for your opinion: identify the killer immediately; ask Layton for advice; investigate the crime scene; or “have a think about it.” The second two choices are pretty straightforward. 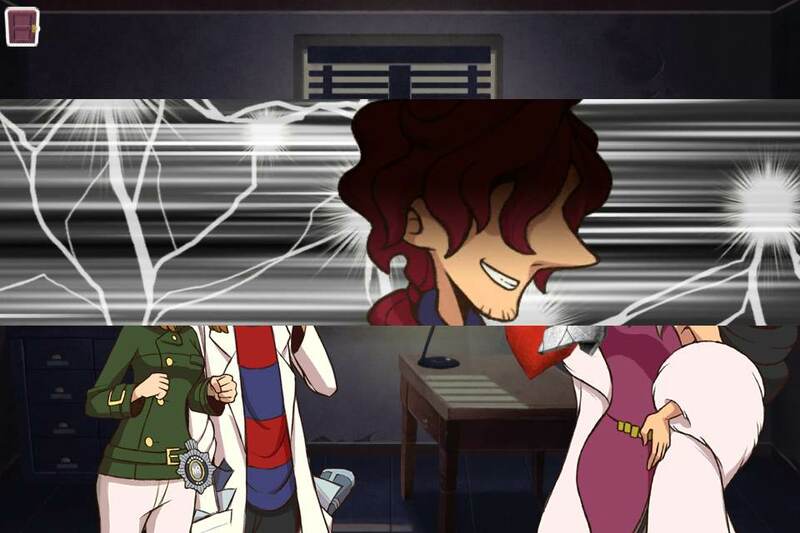 The options that most detract from the whole experience are identifying the killer immediately or choosing to “have a think about it.” With those, Layton will give his opinion of who the guilty party is, give his percentage of certainty of that person’s guilt (usually in the high 90s), and then go straight to questioning said suspect — no examination of the crime scene allowed. As explained above, you still will be able to scrutinize the area when you need to find evidence for a rebuttal, but it seems ridiculous to be allowed to completely bypass any kind of investigation before calling in the suspect to rake them over the coals. Sure, Layton may know perfectly what the correct evidence is, but it’s Lucy who’s directing the interrogation. And if I were the suspect, guilt notwithstanding, I’d be greatly annoyed if I were hauled in to stand before a newbie detective who has absolutely no handle on the situation. I can understand how this way of doing things breaks away from the strict linearity that the Ace Attorney games followed, and that was a big complaint by many people. Rather than having a step-by-step story in which you could get stuck if you happened to overlook a single item or person, Mystery Room allows you to cut right to the chase and doesn’t require you to check every little thing. And the clearly labeled items and check marks in the crime scene let you see at a glance whether there’s anything you missed. In this way, Mystery Room allows players to go their own route according to what they feel their abilities are. If you think you need a bit of hand-holding, you can “ask for advice.” If you think you need a LOT of hand-holding, you can choose to “have a think about it” or try to finger the criminal right away and then investigate the crime scene later without the five-minute limit. But those latter methods also take away the main fun of a mystery game: investigating and forming your own ideas about the solution based on the clues that are presented. This alone makes me ambivalent toward Mystery Room. Although, overall, I did enjoy it — the dialogue isn’t as snappy as the Ace Attorney games, but there’s still plenty of humor; I had a good laugh when I deciphered the name of friendly hotel proprietor Micah Sasucasa, and the volley of argumentative arrows during the showdown with the suspect provides plenty of puns for your pleasure. All in all, though, Mystery Room is a fun game and will do to help tide over fans until the next official Layton or Ace Attorney game is released. 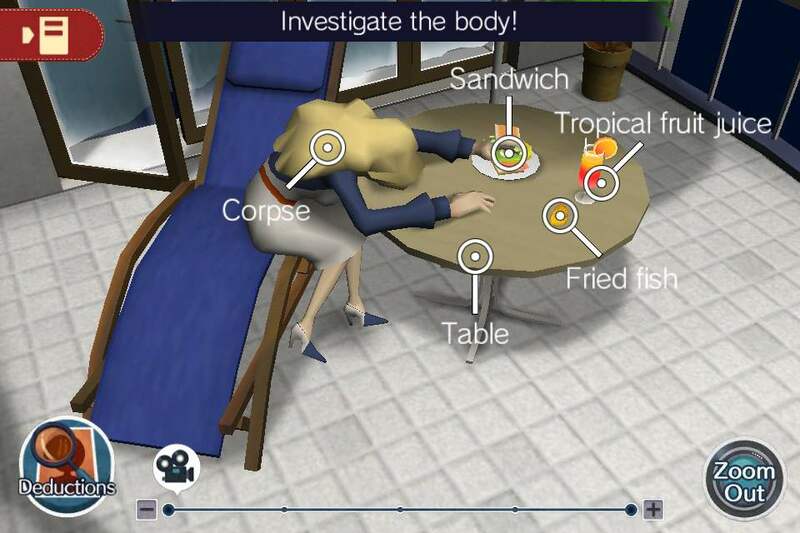 The first three cases are free (which include a prologue and two actual murder mysteries), and the final six cases can be obtained through an in-app purchase.